Calliope Hummingbird, While winter brings most animals down to the valleys and meadows, in summer, there are those that migrate up the mountains. Among them is the calliope hummingbird. This tiny bird forages for flowers in alpine meadows, feasting on nectar, and as the summer progresses, it will migrate up the mountain slopes. That’s because the closer to the summit, the longer the winter conditions last. 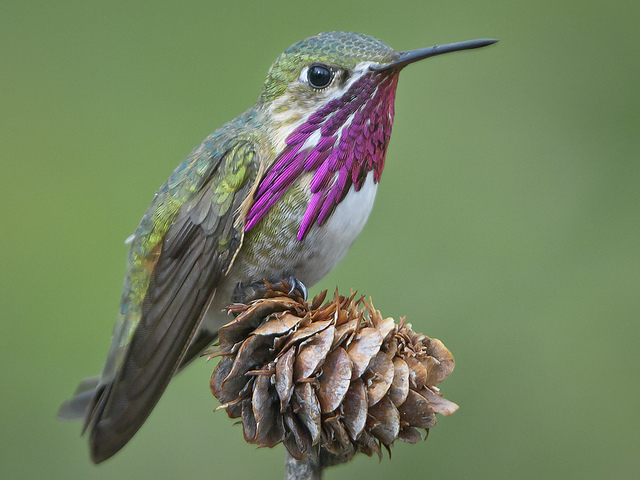 Weighing only an ounce (28 g), the calliope hummingbird is the smallest North American bird and its annual migration along the Rockies is the longest per gram of flesh of any warm-blooded creature.